Airlines are very particular about shipping crate size, so please measure carefully to avoid being turned away at cargo. Height – Crate is tall enough for pet to stand with three inch clearance above the head. Width – Pet can turn around comfortably. Length – Pet can lie down in a natural position with front legs extended. – Measure the length of your pet when standing from the base of his tail to the tip of his nose. – Measure front leg from floor to elbow. 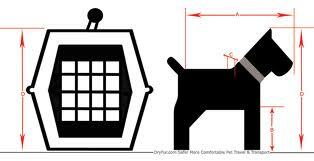 – Add 1/2 of this measurement to length of pet to determine the total length of crate. Measure the height of your pet when standing in a relaxed position with muzzle parallel to the ground, from the floor to the highest point on the head (including ears). Add 3 inches to measurement to determine crate height. 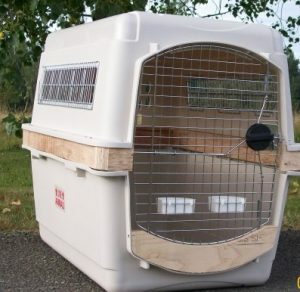 Note if your pet will fit in an XL or Giant crate length wise but does not meet the 3 inch clearance regulation on height, talk to us about adding an extender vs. going to the next size crate which increases the airfare charges. I talked with several different companies and the only one I felt comfortable with was Pet Air Carrier. From my first contact with this company, they were kind, caring and they knew what they were doing. They confirmed the information I had collected on my own and filled in the blanks on the information I needed to know. They were exceedingly patient with me as I worried about the outcome of this whole process.